For Lawrence S. the day the symptoms started began like any other normal weekend. During a trip to Southcenter Mall, he suddenly developed strange arm symptoms. For about 10 seconds, he lost motor control in his arm. He didn’t know why. He put off going to the doctor. A few days later, his hand and face began to tingle. His wife insisted he head to the local fire station where they checked his blood pressure and performed an EKG. The results were normal. Lawrence returned home to spend the rest of his weekend relaxing. However, other family members grew concerned that he was still experiencing symptoms. They insisted he head to the Overlake Medical Center emergency room. Upon arrival, Lawrence received a duplex ultrasound scan of his neck by emergency room personnel. The scan showed that Lawrence’s carotid artery was 95% blocked – a condition that can restrict blood flow to the brain and can cause stroke or death. Lawrence and his wife were in shock. He was referred to Dr. Kathleen Gibson, one of the experienced vascular surgeons at Lake Washington Vascular. Dr. Gibson confirmed the emergency room diagnosis and told Lawrence he needed surgery to remove the blockage right away. Dr. Gibson explained the procedure in detail to reassure Lawrence and his family. The office staff worked with Lawrence to schedule the surgery. Within a few days, Lawrence had his surgery and was back at home. Lawrence took the next two weeks to recover. Lake Washington Vascular staff and care providers taught him how to clean the incision area and what, if any, complications to look for during the healing process. The team at Lake Washington Vascular continues to monitor Lawrence with an annual follow-up exam, looking for any progression or recurrence of his arterial narrowings. 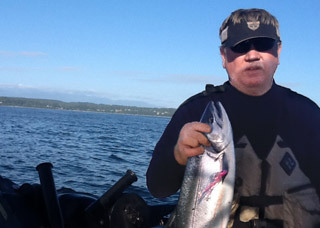 Today Lawrence lives in the South Sound area with his wife and is back to enjoying his life. *All patient photos are actual Lake Washington Vascular patients. Photos are used with their permission and are not re-touched.